The Peskind Law Firm is one of the most experienced divorce and family law firms with 35 years of cumulative experience. Our lawyers have represented the people of Oakbrook diligently, helping them resolve complex divorce and family matters. We regularly represent business owners, executives, and other professionals and their spouses. Here at the Peskind Law Firm, we understand that a divorce can be a particularly stressful and an emotionally challenging process. 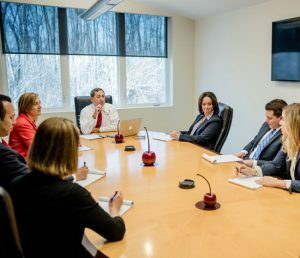 The team we have at Peskind Law is prepared to deal with many of the difficulties that arise during a divorce, not only through litigation, but outside the courtroom as well. If you have any questions about our services or if you are in need of a divorce attorney in Oakbrook, call us today at 630-444-0701. Or you can fill out the contact form on the right and one our knowledgeable associates will respond shortly. Through our years of representing individuals in divorce cases in Oakbrook, we’ve come to realize that legal advice and expertise are not enough to help our clients achieve a successful divorce. Lawyers are prepared to advocate and litigate for you in the courtroom, but that doesn’t mean they are experts in other matters surrounding your divorce. Matters such as financial planning and the emotional challenges faced when your family breaks up. At the Peskind Law Firm, we have professionals that are experienced in assisting our clients with their financial needs and the emotional difficulties of a divorce. As part of our team we have a Certified Public Accountant (CPA) who will assist you with your financial goals moving forward. Our team also has a Certified Divorce Coach to help you set achievable goals during and after your divorce. For more information or if you have any questions about our divorce services in Oakbrook, call us today at 630-444-0701. Or you can fill out the contact form on the right and one of our associates will get back to you as soon as possible.